Jaboticaba, a native fruit from Brazilian Atlantic Forest, is an important source of anthocyanins. Anthocyanins have been recently identified as modulators of lipid metabolism and energy expenditure ‘in vivo’. The purpose of this study was to evaluate the effect of the freeze-dried jaboticaba peel powder on obesity treatment in different experimental models. Obese Swiss mice and obese Sprague-Dawley rats were fed a high-fat diet supplemented with 1, 2 and 4% freeze-dried jaboticaba peel powder for 6 weeks. Energy intake, weight gain and body composition were determined, and the results were analyzed using variance and Tukey's tests (p <0.05). The energy intake was higher in mice groups supplemented with 2% and 4% of jaboticaba peel. In relation to weight gain, the mice supplemented with 2% of jaboticaba peel had higher total weight gain than the other experimental groups, while no significant difference in the fat mass accumulation was observed among the groups. The rats did not show significant differences in the evaluated parameters. These results suggest that the supplementation with freeze-dried jaboticaba peel powder, at concentrations of 1, 2 and 4%, was not effective in the reduction of energy intake, weight gain and body fat both in mice and in rats. Key words: Jaboticaba, anthocyanins, obesity, mice, rats. Palabras clave: Jaboticaba, antocianinas, obesidad, ratones. The increasing prevalence of obese individuals on all continents has had obesity considered as a global epidemic (1). Obesity is characterized by excessive body fat accumulation, which can result in breathing and motor difficulties, dyslipidemias, diabetes mellitus, cardiovascular diseases and some kinds of cancer (2). In this context, some investigations have shown that functional foods can be active against some obesity effects. Several studies have indicated that bioactive components in food could play a role on the control of energy balance and promotion of weight loss (1). Anthocyanins, phenolic compounds belonging to the flavonoid family, responsible for the red, blue, violet and pink colors from fruits, vegetables and flowers, are among potential allies in the fight against obesity (3). Anthocyanins are known for their antioxidant properties, inhibitory action of several tumors, and possible protective effects in cardiovascular diseases (4). Recently, anthocyanins have been identified as modulators of lipid metabolism and energy expenditure, reducing fat mass in rats and acting positively in the lipid profile (5). The consumption of fruits like blueberry, raspberry, strawberry and blackcurrant, rich in anthocyanins, has been associated with reduced body weight and appetite in animal studies. Kim et al. (1) proved that anthocyanins, independently from the fiber content of the fruits can be active against obesity; they found that the consumption of blueberry soluble extract reduced some obesity parameters in animal models. Jaboticaba (Myrciaria jaboticaba), a native fruit from the Brazilian Atlantic Forest, has a peel with high concentrations of anthocyanins. This Brazilian fruit is used in jams, liqueurs and vinegars, but its use in food industry in not fully exploited (6). Several authors state that jaboticaba could be considered a Brazilian berry, given that its anthocyanins composition is similar to other berries, more specifically, the blackberry, in which delphinidin-3-glucoside and cyanidin-3-glucoside were identified (7). Although anthocyanins rich fruits and/or purified anthocyanins are associated with reduced obesity, studies that correlate jaboticaba consumption and weight control are scarce. Therefore, this study aimed to investigate the possible role of jaboticaba anthocyanins on the treatment of obesity. In this way, energy intake, weight gain and body composition of mice and rats fed high-fat diet supplemented with freeze-dried jaboticaba peel powder in different concentrations were tested. The jaboticaba fruits (Myrciaria jaboticaba Vell berg) were obtained directly from producer (Aguaí, São Paulo State, Brazil), during the main harvest season in September 2008. The fruits were manually washed with fresh water and the peels were separated and frozen at -20 °C. The frozen peels were lyophilized and grounded into a fine powder by an electrical Mill. The freeze-dried powder was kept in airtight containers and stored at -80 °C. The anthocyanins extraction of freeze-dried jaboticaba peel was performed according to Wu (8), with subsequent determination in liquid chromatography equipped with a diode array detector and a C18 column. Total and individual anthocyanins identification and quantification were performed according to Favaro (9), with slight modifications. The identification of compounds was performed by retention time analysis, in comparison with anthocyanins standards. The concentrations were determined according to a calibration curve constructed from anthocyanins standards. Analyses of moisture, total protein and ash were performed according to methods described by the Association of Official Analytical Chemists (AOAC) (10). Total lipids were determined by Bligh; Dyer (11), and the determination of soluble and insoluble fiber was carried out according to ASP et al. (12). The carbohydrate concentration in the freeze-dried jaboticaba peel was obtained by difference. Five different diets were prepared: standard AIN-93G diet (13), with protein concentration of 12% (14) (C diet); modified AIN-93G high-fat diet, with 12% of protein and 35% (wt/wt) of lipids (HF diet); and three high-fat diet supplemented with freeze-dried jaboticaba peel powder, in concentrations of 1, 2 and 4% (wt/wt) (HFJ1, HFJ2 and HFJ4 diets). The concentrations of freeze-dried powder in the diets were determined according to a preliminary study conducted by our research group (15). The high-fat diets were prepared with less amount of carbohydrates (starch, maltodextrin and sucrose), due to the lard addition. In diets supplemented with freeze-dried jaboticaba peel powder, the added cellulose was reduced, as the fruit peel is a good source of dietary fiber. The chemical composition of experimental diets was determined by moisture, ash, protein (10) and total lipids analysis (11). Carbohydrates concentration was obtained by difference, and energy content was determined using isoperibol automatic calorimeter (PARR 1261) with oxygen pump (PARR 1108). 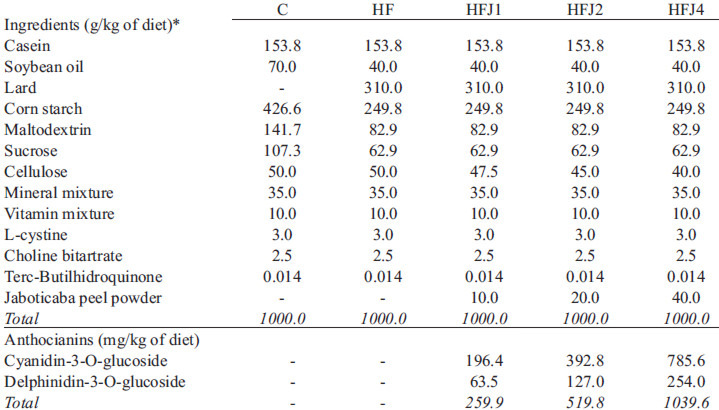 The formulation and the chemical composition of diets are presented in Tables 1 and 2. *Ingredients expressed in g/kg of diet. C: control diet, HF: high-fat diet HFJ1: high-fat diet supplemented with 1% of jaboticaba peel powder HFJ2: high-fat diet supplemented with 2% of jaboticaba peel powder HFJ4: high-fat diet supplemented with 4% of jaboticaba peel powder. TABLE 2 Chemical composition of experimental diets. Despite the different formulation of high-fat diets (HF, HFJ1, HFJ2 and HFJ4), these were similar in fat content and differed only from the AIN93-G control diet, which did not receive lard. Significant differences also occurred among the moisture and ash values in HFJ1, HFJ2 and HFJ4 diets. These differences are consequence of jaboticaba peel powder supplementation, which has important minerals and moisture concentration. Moreover, it was observed that the carbohydrates concentration differs among the experimental groups; this fact is explained by partial replacement of carbohydrates by lard in high-fat diets. In relation to energy density (Table 2), there was significant difference between the control diet and high-fat diets, but the high-fat diets with and without freeze-dried jaboticaba peel powder supplementation were isoenergetic. The animals used in this study were from University of Campinas Breeding Center. The investigation was approved by Ethics Committee for Animal (Permission 2020-1/2010 and 2226-1/2010) and followed the University guidelines for the use of animals in experimental studies. The animals were maintained at 22±1°C, on a 12 hours artificial light/dark cycle, and housed in individual cages. Swiss male mice were used in Experiment 1, and Sprague-Dawley males in the Experiment 2. In both tests the newly weaned animals were randomly divided into five groups (n = 8), with 7 days of acclimatization and 10 weeks of experiment. C and HF groups received respective diets throughout the experimental period, while HFJ1, HFJ2 and HFJ4 groups received high-fat diet during four weeks and high-fat diet supplemented with jaboticaba peel powder during the last 6 weeks. Biological analysis. The diet intake and the body weight gain were checked every two days and once a week, respectively. Food was changed twice a week, or whenever necessary, to minimize lipid oxidation and anthocyanins deterioration. The body composition was determined according to Park et al. (16), by removing the intestinal contents to obtain the empty carcass. Later, the carcass was frozen, sliced, freeze-dried, crushed and stored at -80ºC until the determinations of moisture, total ash, protein (10) and total fat (11). Data analysis was performed using the Statistical Analysis System (SAS) 9.1.3 program. On-way Analysis of Variance (ANOVA) and Tukey’s test (p< 0.05) were used in order to compare the average of the results. Determination of anthocyanins and chemical composition in freeze-dried jaboticaba peel. The delphinidin-3-glucoside and the cyanidin-3-glucoside anthocyanins were identified in freeze-dried jaboticaba peel by chromatographic analysis. Cyanidin-3-glucoside was found to be the predominant anthocyanin in the product, representing 75.6% of total anthocyanins. The chemical composition of freeze-dried jaboticaba peel powder used as supplement in experimental diets is presented in Table 3. TABLE 3 Chemical composition and energy content of freeze-dried jaboticaba peel powder. *Analysis of the composition of the jaboticaba peel: moisture, protein, lipid and ash were performed in triplicate and the results are expressed as average ± standard deviation. ** N x 6.25. Energy intake and weight gain. Daily average energy intake (kcal/animal/day) for mice (a) and rats (b) during 10 weeks of experiments are shown in Figure 1. 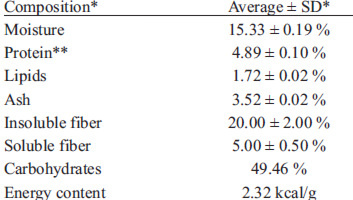 FIGURE 1 Daily average energy intake (kcal/animal/day) for mice (a) and rats (b) during 10 weeks of experiments. C: control diet, HF: high-fat diet; HFJ1: high-fat diet supplemented with 1% of jaboticaba peel powder; HFJ2: high-fat diet supplemented with 2% of jaboticaba peel powder; HFJ4: high-fat diet supplemented with 4% of jaboticaba peel powder. The bars represent average ± SE. Different letters means that the values are statistically different (p > 0.05). Mice fed with 2% and 4% of jaboticaba peel on the diet showed higher daily energy intake than HF group. Rats fed with 4% of jaboticaba peel also showed higher daily energy intake than HF group, but without statistical difference. Some changes in feeding patterns were observed in the experiment with mice (Figure 1a). The daily energy intake was statistically higher in groups fed with high-fat diets compared to lean control group. In addition, animals fed with 2% and 4% of jaboticaba peel on the diet showed higher daily energy intake than HF group. 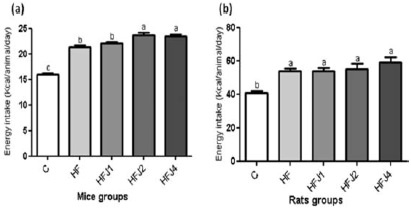 In contrast, this pattern was not repeated in the experiment with the rats: the groups fed with high-fat diets, with and without freeze-dried jaboticaba peel powder, did not show different energy intakes (Figure 1b). The cumulative weight gain values in both animal models, throughout the 10 experimental weeks are displayed in Figure 2. FIGURE 2 Total weight gain of mice (a) and rats (b) after 10 weeks of experiments. C: control diet, HF: high-fat diet; HFJ1: high-fat diet supplemented with 1% of jaboticaba peel powder; HFJ2: high-fat diet supplemented with 2% of jaboticaba peel powder; HFJ4: high-fat diet supplemented with 4% of jaboticaba peel powder. The bars represent average ± SE. Different letters represent statistical difference (p > 0.05). The high-fat diets supplemented with jaboticaba peel powder did not reduce total weight gain in different animal models. As expected, in both experiments, the animals that ate the high-fat diets showed greater cumulative weight gain compared to the groups that received control diets. Supplementing the high-fat diets with 1%, 2% and 4% of jaboticaba peel powder did not protect obese mice and rats of additional weight gain. Instead, in the experiment with Swiss mice (Figure 2a), the HFJ2 group showed significantly greater total weight gain than other groups fed with diets rich in saturated fatty acids. Similar results were obtained in the experiment with Sprague-Dawley rats (Figure 2b) for the HFJ4 group, without statistical significant difference, however. Thus, the higher energy intake was found to be closely associated with the highest cumulative weight gain in these treatments. Body composition. The body compositions of mice fed with different diets after 10 experimental weeks are shown in Table 4. *Dry weight value, after carcass freeze-drying. **Conversion factor used to protein: N = 6.25. C: control diet, HF: high-fat diet HFJ1: high-fat diet supplemented with 1% of jaboticaba peel powder HFJ2: high-fat diet supplemented with 2% of jaboticaba peel powder HFJ4: high-fat diet supplemented with 4% of jaboticaba peel powder. Results are expressed as average ± SD. Values with different letters on the same row show statistical difference (p <0.05). The high-fat diets supplemented with jaboticaba did not significantly alter body composition of mice and rats. Groups HF and HF2 showed statistically lower content of proteins in carcasses compared to group C (control). Furthermore, there was no change in lean mass content among the HF group and the groups supplemented with freeze-dried jaboticaba peel powder (HFJ1, HFJ2 and HFJ4). Groups HF, HFJ1, HFJ2 and HFJ4 showed statistically higher contents of lipids in the carcass compared to control. On one hand, these data proved that the higher weight gain observed in all high-fat groups was proportional to the largest fat mass accumulation. On the other hand, despite the rats from HFJ2 showed greater weight gain they did not accumulated more fat mass compared to the other high-fat groups. Significant differences on moisture contents were observed among mice groups, with values varying between 0.7% and 1.6%. The carcasses were freeze-dried before analysis, which explains the very low moisture contents. Finally, the ash content was largely different among the group C and the other (HF, HFJ1, HFJ2 and HFJ4). Despite the higher mineral concentration in diets supplemented with jaboticaba peel, there was a significant reduction in the ash concentration in carcasses of the animals from all high-fat groups. The amounts of protein, fat, moisture and ash, corresponding to body composition of Sprague-Dawley rats at the end of the experiment are also presented in Table 4. Protein and fat contents were not statistically different among the groups, regardless the clear differences on the diet offered to each group. Nevertheless, the animals that received high-fat diets (with and without jaboticaba peel powder) presented lower ash contents. The chromatographic profile of the sample is in accordance to Terci (17); however, this Brazilian study also identified the presence of peonidin-3-glucoside in the jaboticaba peel. Reynertson et al. (18) identified the presence of cyanidin-3-glucoside and peonidin-3-glucoside in jaboticaba. Unfortunately, authors mentioned above did not describe the variety of jaboticaba used in their studies, which may be decisive for the composition of anthocyanins. The jaboticaba peel is composed mainly of carbohydrates (including soluble and insoluble fiber) and water. Probably, the high content of carbohydrate found reflects the large amount of simple and structural sugars, which in general are the major constituents of fruit peels (19). Several studies have evaluated the effects of anthocyanins rich fruits and/or anthocyanins purified on the development of obesity. The results presented in most of these studies are not consistent with the data found in this work, both in terms of energy intake and weight gain. Tsuda et al (20) showed that mice submitted to high-fat diet (HFD) supplemented with 2% cyanidin-3-glucoside from purple corn, although presented no difference in energy intake, and had lower weight gain compared to the HFD. Recently, Prior et al. (21) supplemented high-fat diet offered to mice with freeze-dried blueberries, freeze-dried strawberries or purified cyanidin-3-glucoside. Animals fed with purified cyanidin-3-glucoside showed a reduction in weight gain, while those fed freeze-dried fruits at a concentration of 10% had higher weight gain. In a similar study, DeFuria et al. (22) fed mice with high-fat diet plus 4% freeze-dried blueberry, and the animals did not show changes in energy intake and weight gain compared to the control group. The freeze-dried jaboticaba peel powder addition clearly changed sensory characteristics (color and flavor) of the diets. The animal preference for diets added with jaboticaba peel powder was evident: the animals were previously fed with HF diet for 4 weeks, and after the diet was changed by the jaboticaba peel supplemented diets (data not shown). The animals of all the groups that received diets added with jaboticaba powder HFJ1, HFJ2 and HFJ4 showed higher intakes of feed. The improved palatability of jaboticaba diets may have increased energy intake and, consequently, it caused the higher weight gain in these groups. Although the animals’ bone masses have not been assessed, the lower ash content in high-fat groups may indicate a reduction on bone mineralization. Both adipocytes and osteblasts originate from mesenchymal stem cells; with increased formation of adipocytes caused by supplementation with lard, cell differentiation in osteoblast may have been lower and, consequently, bone formation was reduced (23). Based on the body composition results shown, it can be concluded that supplementation of diet with freeze-dried jaboticaba peel powder did not modulate lipid metabolism and did not reduce fat mass in the different experimental models. Prior et al. (24) analyzed, by magnetic resonance imaging, the body composition of mice fed with high-fat diet and low-fat diet (LF), both supplemented with blueberries (juice and freeze-dried fruit) and purified anthocyanins. The authors found that animals fed with high-fat diet had higher fat mass (%) and lower lean mass (%) compared to those given low-fat diet. These results are consistent with the ones reported in our study, indicating that supplementation with berries rich in anthocyanins and even with purified anthocyanins did not change body composition. However, it is noteworthy that the time of the experiment may have negatively influenced body composition. Perhaps longer treatments with freeze-dried jaboticaba peel powder should result in significant changes in body composition. It is suggested that the purified anthocyanins have positive effects on reducing obesity and metabolic changes resulting from this disease, as previous studies have showed lower effectiveness of the fruits source of anthocyanins compared to the use of the purified compound. In an attempt to explain the lower efficiency of fruit in reducing obesity, it is suspected that there may be some compound in the fresh fruit that slows the anthocyanins absorption, reducing its bioavailability and, consequently, the effectiveness of its action (25). Freeze-dried jaboticaba peel powder in different concentrations was not effective in the prevention of body weight gain and lipid contents on the carcasses of mice and rats as experimental models. Divergences found respect to other studies can be attributed to the concentration of jaboticaba peel added to the diets and the use of jaboticaba peel as an anthocyanin source instead of purified anthocyanins. Thus, further experiments are needed in order to obtain more evidences about the role of anthocyanins on obesity treatment. Kim KH, Park Y. Food components with ant-obesity effect. Annual Review of Food Science and Technology. 2011; 2: 237-57. Pinheiro ARO, Freitas SFT, Corso ACT. Uma abordagem epidemiológica da obesidade. Revista de Nutrição. 2004; 17: 523-33. Brito ES, Araújo MCP, Alves RE, Carkeet C, Clevidence BA, Novotny JA. Anthocyanins present in selected tropical fruits: acerola, jambolão, jussara, and guajiru. J Agric Food Chem. 2007; 55: 9389–94. Hollman PCH, Katan MB. Dietary flavonoids: intake, health effects and bioavailability. Food Chem Toxicol. 1999; 37: 937-42. Kwon S, Ahn I, Kim S, Kong C, Chung H, Do M et al. PARK. Anti-obesity and hypolipidemic effects of black soybean anthocyanins. Journal of Medicinal Food. 2007; 10: 552-56. Silva GJF, Constant PBL, Figueiredo RW, Moura SM. Formulação e estabilidade de corantes de antocianinas extraídas das cascas de jabuticaba (Myrciaria ssp), Alim Nutr. 2010; 21: 429-36. Wu X, Gu L, Prior RL, Mckay S. Characterization of anthocyanins and proanthocyanidins in some cultivars of ribes, aronia, and sambucus and their antioxidant capacity. J Agric Food Chem. 2004; 52: 7846-56. Favaro MMA. Extração, estabilidade e quantificação de antocianinas de frutas típicas brasileiras para aplicação industrial como corantes [dissertation]. Instituto de Química: Universidade Estadual de Campinas; 2008. Association of Official Analytical Chemists. Official methods of analysis of AOAC. 16. ed. Virginia: AOAC International; 1995. Bligh EG, Dyer WJ. A rapid method of total lipid extraction and purification. Canadian Journal of Biochemistry and Physiology. 1959; 37: 911-17. Asp NG, Johansson CG, Hallmer H, Siljestrom M. Rapid enzimatic assay of insoluble and soluble dietary fiber / Rapidos ensayos enzimaticos de fibra dietetica soluble e insoluble. J Agric Food Chem. 1983; 31: 476-82. Reeves PG, Nielsen FH, Fahey Jr GC. AIN-93 Purified diets for laboratory rodents: final report of the American Institute of Nutrition Ad Hoc Writing Committee on the Reformulation of the AIN-76A rodent diet. J Nutr. 1993; 123: 1939-51. Goena M, Marzo F, Fernández-González L, Tosar A, Frühbeck G, Santidrián S. Effect of the raw legume Vicia ervilha on muscle and liver protein metabolism in growing rats. Rev Esp Fisiol. 1989; 45: 55-60. Leite AV, Malta LG, Riccio MF, Eberlin MN, Pastore GM, Maróstica Júnior MR. Antioxidant potential of rat plasma by administration of freeze-dried jaboticaba peel (Myrciaria jaboticaba Vell Berg). J Agric Food Chem. 2011; 59: 2277-83. Park Y, Albright KJ, Liu W, Storkson JM, Cook ME, Pariza MW. Effect of conjugated linoleic acid on body composition in mice. Lipids. 1997; 32: 853-58. Terci DBL. Aplicações analíticas e didáticas de antocianinas extraídas de frutas [thesis]. Instituto de Química: Universidade Estadual de Campinas; 2004. Reynertson KA. Phytochemical analysis of bioactive constituents from edible myrtaceae fruits [thesis]. Faculty in Biology: City University of New York; 2007. Damodaran S, Parkin KL, Fennema OR. Química de alimentos de Fennema. 4.ed. Porto Alegre: Artmed; 2010. Tsuda T, Horio F, Uchida K, AokI H, Osawa T. Dietary cyanidin 3-O-b-D-glucoside-rich purple corn color prevents obesity and ameliorates hyperglycemia in mice. J Nutr. 2003; 133: 2125–30. Prior RL, Wu X, Gu L, Hager TJ, Hager A, Howard LR. Whole berries versus berry anthocyanins: interactions with dietary fat levels in the C57BL/6J mouse model of obesity. J Agric Food Chem. 2008; 56: 647–53. DeFuria J, Bennett G, Strissel KJ, Perfield JW, Milbury PE, Greenberg AS et al. Dietary blueberry attenuates whole-body insulin resistance in high fat-fed mice by reducing adipocyte death and its inflammatory sequelae. J Nutr. 2009; 139: 1510-16. Xiao Y, Cui J, Li YX, Shi YH, Le GW. Expression of genes associated with bone resorption is increased and bone formation is decreased in mice fed a high-fat diet. Lipids. 2010; 45: 345-55. Prior RL, Wilkes S, Rogers T, Khanal RC, Wu X, Hager TJ et al. Dietary black raspberry anthocyanins do not alter development of obesity in mice fed an obesogenic high-fat diet. J Agric Food Chem. 2010; 58: 3977-83. Prior RL, Wilkes SE, Rogers TR, Khanal RC, Wu X, Howard LR. Purified blueberry anthocyanins and blueberry juice alter development of obesity in mice fed an obesogenic high-fat diet. J Agric Food Chem, 2010; 58: 3970-76.